A family of four could buy land and a cottage, completely furnished, for $750 in Seal Beach. Only $75 was required as a down payment, followed by monthly payments of $10. The city and its beach was a perfect place for families to picnic and feed the seals, in fact there was soon to be a seal farm. In accordance with its name, Seal Beach is to have a seal farm, so states the latest announcement, where seals and sea lions are to be tamed and trained to perform. Work of developing this farm is now in progress and already several large seals have been secured. The farm is to be fostered by the Guy M. Rush Company and the Pacific Electric Railway, together with the Bayside Land Company. The farm will be located at the Seal Beach end of the trestle of the Long Beach line of Alamitos Bay. It is planned to spend several thousand dollars in erection of proper buildings and comfortable pens for the animals. "The World's Most Famous Smiles. 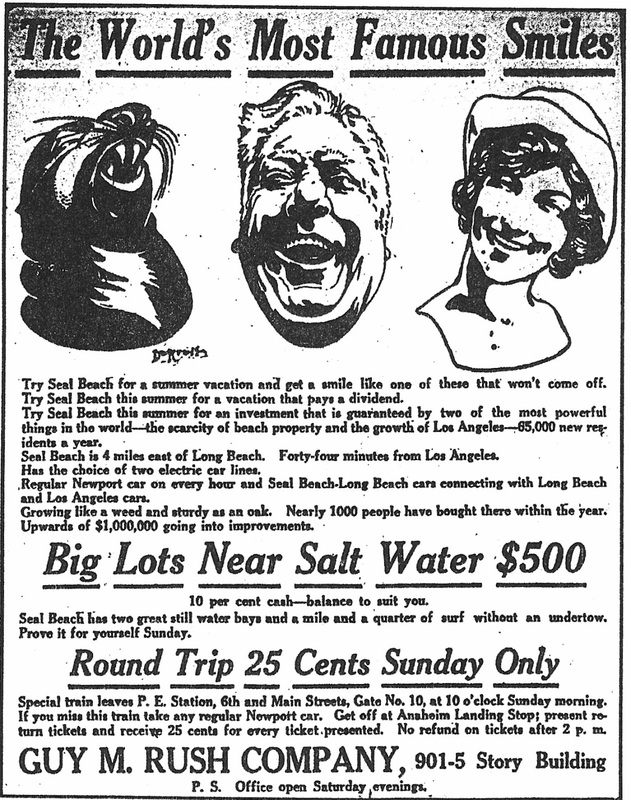 Try Seal Beach for a summer vacation and get a smile like one of these that won't come off. Try Seal Beach this summer for a vacation that pays a dividend. Try Seal Beach this summer for an investment that is guaranteed by two of the most powerful things in the world - the scarcity of beach property and the growth of Los Angeles - 65,000 new residents a year. Seal Beach is 4 miles east of Long Beach. Forty-four minutes from Los Angeles. Has the choice of two electric car lines. Regular Newport car on every hour and Seal Beach-Long Beach cars connecting with Long Beach and Los Angeles cars. Growing like a weed and sturdy as an oak. Nearly 1000 people have bought there within the year. Upwards of $1,000,000 going into improvements." but it was strictly a man's game, no women allowed. The game originated in France and the term "billiard" came from the French word for stick, "bille." In 1575, King Henry II was the first of many French monarchs to adopt the sport installing a primitive triangular-shaped table in his chateau. The earliest tables were equipped with obstacles such as hoops and pegs, but the French simplified "the royal game," as they called it, as they went along. The sport was so popular in the American colonies that leading figures of the Revolution, such as George Washington and Thomas Jefferson, devoted as much of their spare time to the cue as they did working for the cause of freedom. The White House always had a billiard room, and Abraham Lincoln was one of many presidents who took to the billiard table after a hard day dealing with affairs of state. A major improvement in equipment occurred midway in the nineteenth century when piano manufacturers turned out standardized billiard tables. 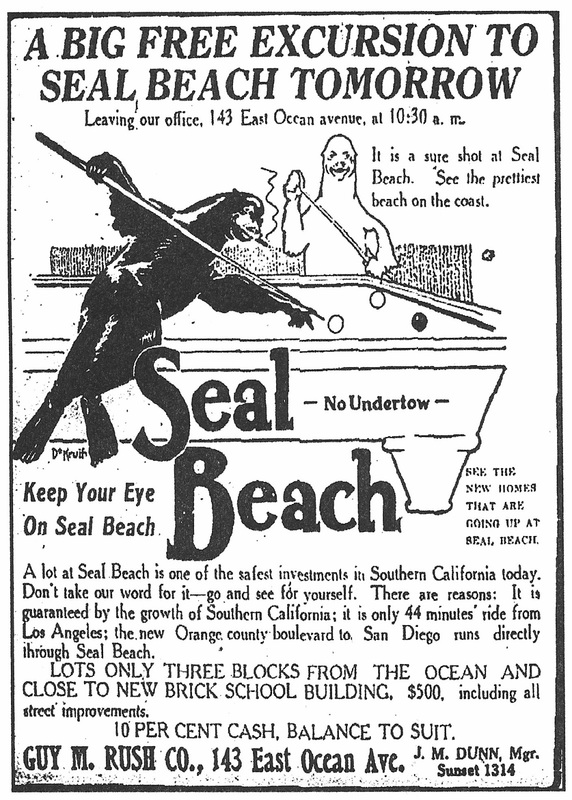 In the late 1890s - 1920s it was fashionable to boast that you had a billiard table in your home or community, which Seal Beach did in this July 1914 ad. 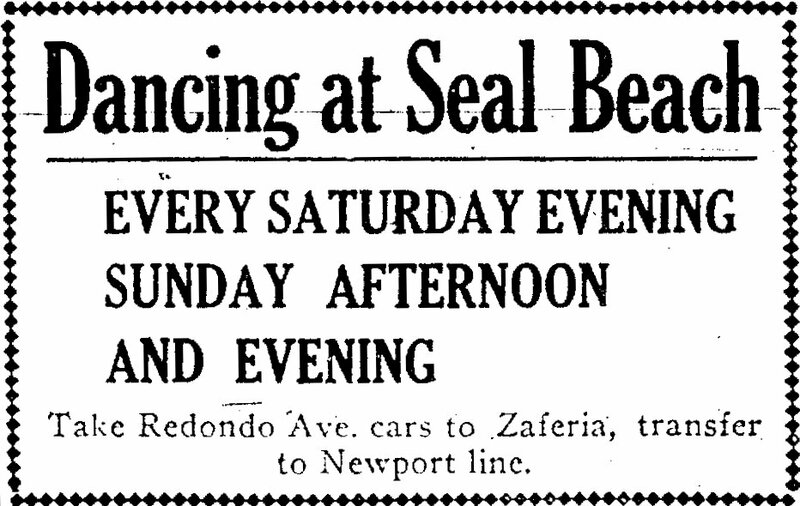 Besides billiards, dancing was popular in Seal Beach as this ad shows. "A vacation opportunity. Seal Beach. Twin pavilions and pier, costing $100,000, complete and now in use. They contain the finest dancing floor on the coast and finest bowling alleys possible to build. 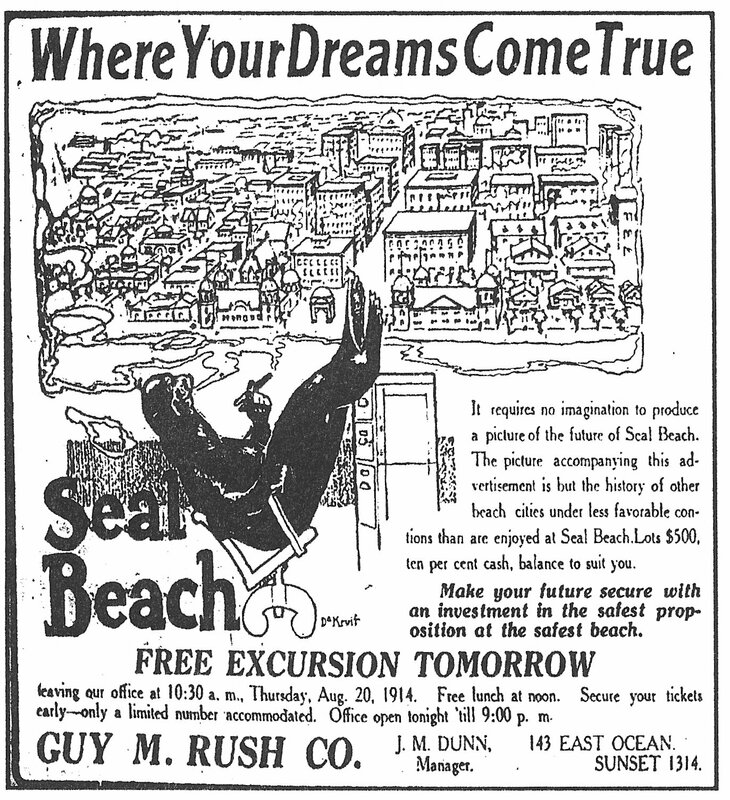 Over 300 dressing rooms for the accommodation of bathers, modern in every respect and a beach without an undertow..."
The Guy M. Rush Real Estate Company planned to make the pier a "Jeweled City," dazzling with electric lights. They got this idea from the Tower of Jewels at the San Francisco Exposition of 1915. In 1916, the Bayside Land Company purchased several of the great scintillators from the exposition which added sparkles and flashes to the electric lights, adding them to the Seal Beach pier. "Planning the play time home. Seal Beach. Put it where the fun is. Put it on the shores of the Pacific with nothing between you and China but blue water and salt breezes. Put it between the two great still water bays, where there is motor boating, swimming, fishing, hunting, motoring, dancing, clam bakes and good old-fashioned loafing. Put it by the sea where the undertow is left out. Put it 44 minutes from Los Angeles - 4 miles from Long Beach. Put it where it will pay a dividend in dollars as well as joy. Atlantic City property doubled in valuation in less than seven years. 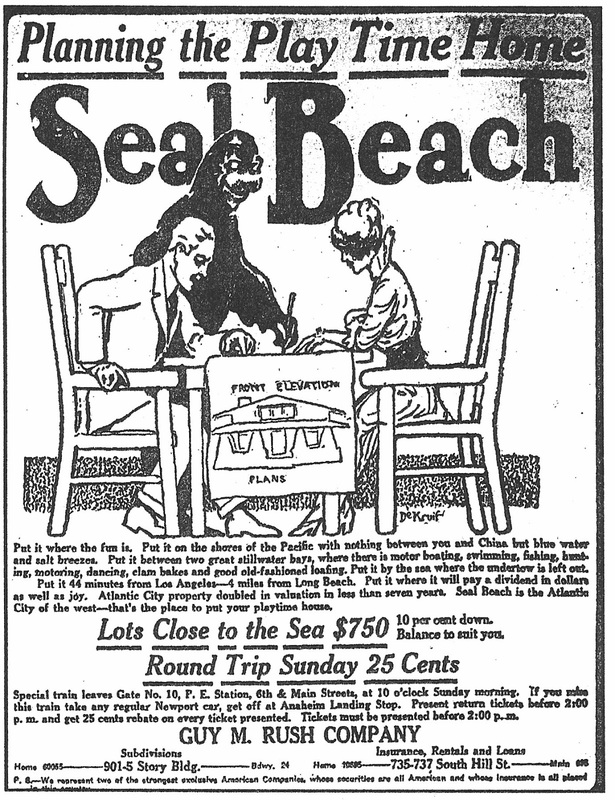 Seal Beach is the Atlantic City of the west - that's the place to put your playtime house..."
A price for a Seal Beach lot close to the sea was $750, not bad considering that a lot on Long Island, New York, of the same size in 1914 would cost you $3,000. "Where your dreams come true. It requires no imagination to produce a picture of the future of Seal Beach. 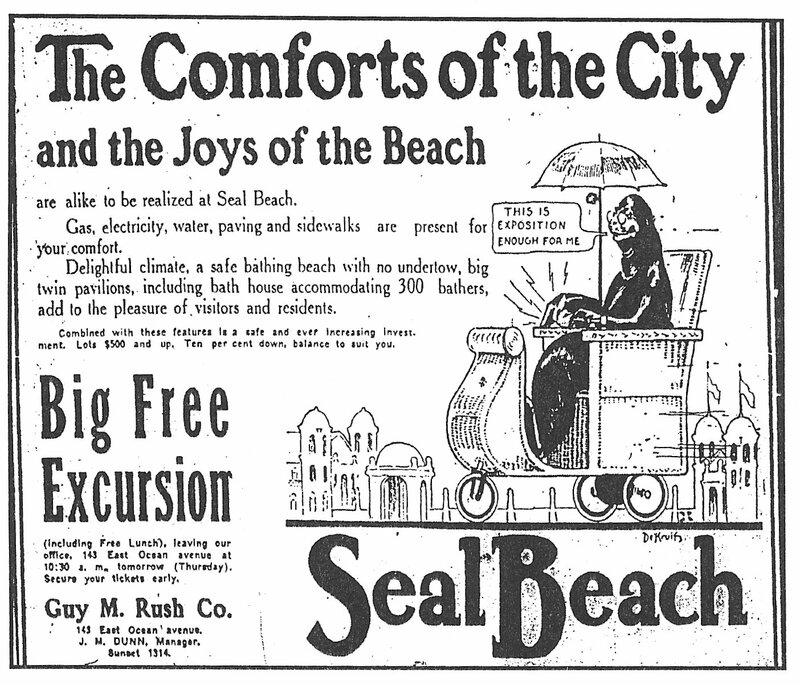 The picture accompanying this advertisement is but the history of other beach cities under less favorable conditions than are enjoyed at Seal Beach..."
In Seal Beach your dreams could come true. There was still vast acreage the city could expand into and money to be made. Eleven thousand acres of farmland belonging to the Hellman ranch extended north of Seal Beach. Here farmers grew beans, sugar beets and barley. I.W. Hellman was thinking of subdividing this land he acquired in the 1880's into ten and twenty-acre tracts as Seal Beach expanded. "The comforts of the city and the joys of the beach are alike to be realized at Seal Beach. Gas, electricity water, paving and sidewalks are present for your comfort. Delightful climate, a safe bathing beach with no undertow, big twin pavilions, including bath house accommodating 300 bathers, add to the pleasure of visitors and residents..."
"Tickle Your Tummy Just Once. Get a shore dinner at Seal Beach - the place where good shore dinners flourish. Live at Seal Beach all the year round. Cook shore dinners for yourself. Get a lot now while there is till a choice. 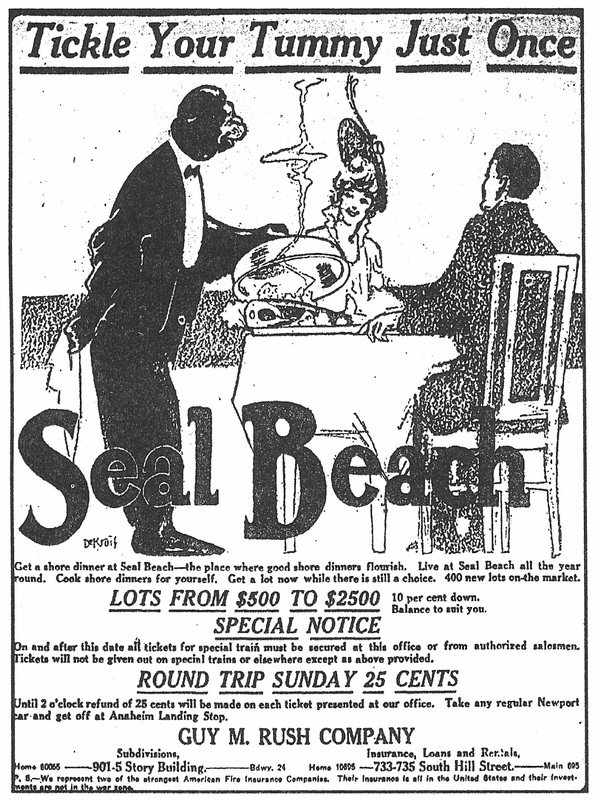 400 new lots on the market..."
This ad helped publicize that a special fish dinner was to be served at the Seal Beach Inn and a dance given in honor of Labor Day. The committee in charge of the Labor Day picnic to be held at Seal Beach September 7 are shaping up and adding to their program. There will be professional and semi-professional bicycle races with prizes which have been donated by different bicycle supply houses. The committee is making a diligent search for a fat man to race against Frank Rector as they do not want to fall down on any part of their program. W.F. Maurer will attempt to beat Beechie in a loop-the-loop in a two-by-four baby arrowplane. The winner will meet H.T. Marsh in his Ford at the top of the flagpole and together will put up a pennant "Long Beach - The Fastest Growing City on the Continent." R. Fay Taggart will then swallow the ocean to show how easy it is done. He is now in San Pedro practicing up. If any of these contestants fail to show up Robert Strathern, H.H. Brown and A.E. Waggoner will take their places. A prominent Labor Day speaker will be present ---Mr. J.B. Bowen, international organizer of the L.I.U. of Cleveland, Ohio. trip and the assurance of a delightful day. Two still water bays and the surf without an undertow. The same boulevards that lead to Seal Beach also take you to the safest, sanest investment to be had in Southern California - guaranteed by nature and the fastest developing section of the entire country. Lots $500 and up, easy payments." All sorts of activities were planned for Seal Beach's Labor Day picnic. Seal Beach is the Mecca for thousands on Labor Day and it is expected that all facilities for the accommodations of the crowd will be tested to the fullest extent. However, Seal Beach has grown rapidly during the past year and the accommodations for taking care of the crowd have been tripled. Several organizations are having their outing there. From Long Beach a thousand members of the building trades organization with their wives and families will have an old-fashioned outing with outdoor sports. The railway mail clerks, who make Los Angeles their headquarters, are listening to the murmur of the waves and splash in the surf instead of trying to keep their balance on swaying mail cars. Three hundred of them with their families will occupy another portion of the beach and forget the distractions of the route case. Five hundred mail clerks from the Los Angeles post office are making merry with a big campfire, clam roast, baseball game and other athletic entertainments. Seal Beach was comfortably crowded on Labor Day with a crowd estimated at fully three thousand people, a great portion of whom came from Long Beach. From early morning the streetcars were crowded and auto busses carried hundreds to the lively little resort. there were also about five hundred from Los Angeles Railway and post office mail clerks. The large basket picnic was served in the picnic pavilion, and groups were clustered under the pier and wherever a shady spot could be found. Free coffee and sugar was served to all. At 2 p.m. the dance hall was thrown open and the dance continued till 11 o'clock. The program of sports was started about 2 p.m. The first contest was a 50-yard dash for boys won by Clarence Gilman of Los Angeles. Prize ,$3 hat donated by Hansen's Clothes Shop. The second contest girls' 50-yard dash was won by Mary McClaren, 411 East First Street. Prize box of candy donated by Purycar's Sanitary Grocery Co.
Lady's race won by Mrs. Katie Densmore (Signal Hill). Prize, 2-pound box of candy from Miller's Chocolate Shop. The heavy ladies' race was hard contested, requiring three heats, and was finally declared a draw, each lady receiving a box of candy. The participants in the last heat were Mrs. F.J. Roberts of Los Angeles and Mrs. Roy Culp of Redondo Avenue. Prizes from Miller's Chocolate Shop. Fat men's race was won by Charles Faulstick. Prize, box of cigars donated by Arthur Myers. Free-for-all won by C. Gillmore, Los Angeles. Box of cigars donated by Building Trades Council. Sack race won by Clarence Adams of Seal Beach. Prize, shirt donated by Silverwood's store with a conscience. The tug of war between the Los Angeles mail clerks and the Long Beach Building Trades Council was won by the latter with ease. Prize, box of cigars donated by the Trades Council. The relay race between the Los Angeles mail clerks and Long Beach Building Trades Council was won by the mail clerks. The child's race, under 6 years of age was won by David S. Kingsbury, 524 West Broadway, Prize, a chair donated by F.H. Downs Furniture Co.
Semi-professional bicycle race, first prize won by Jimmie Fisher, and second prize by Vick Stein both of Long Beach. There was a fine ball game between the railway and Los Angeles mail clerks won by the former. The two mail clerk organizations joined in with the Long Beach delegation and helped greatly to make the day a complete success. It was one of the best outings the labor organizations have enjoyed for years. 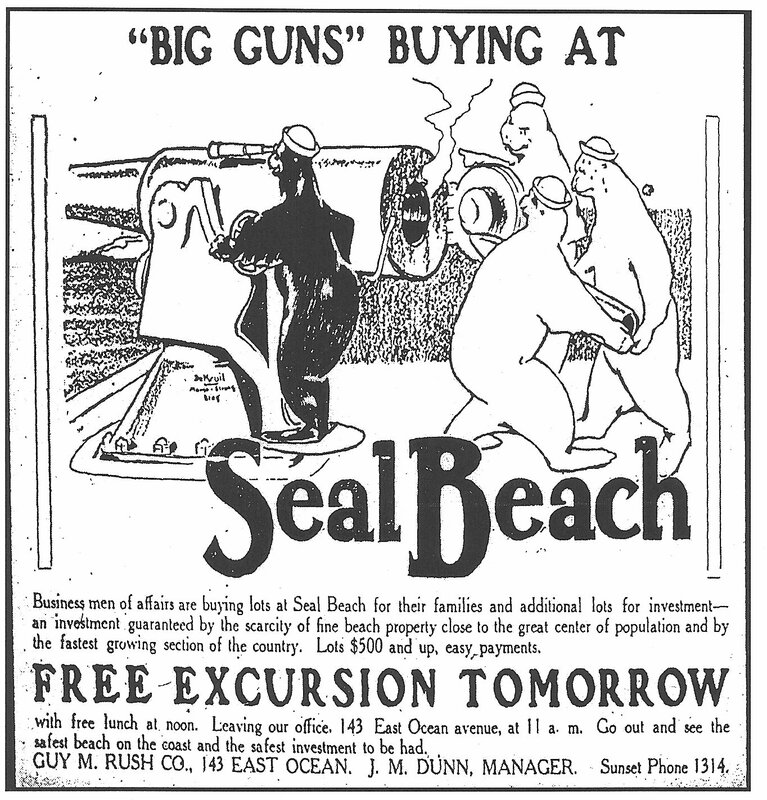 "'Big guns' buying at Seal Beach. Businessmen of affairs are buying lots at Seal Beach for their families and additional lots for investment - an investment guaranteed by the scarcity of fine beach property close to the great center of population and by the fastest growing section of the country. Lots $500 and up, easy payments." On August 1, 1914, Germany declared war in Europe. Americans vowed to remain neutral, but as this ad illustrates, America was prepared to defend itself. 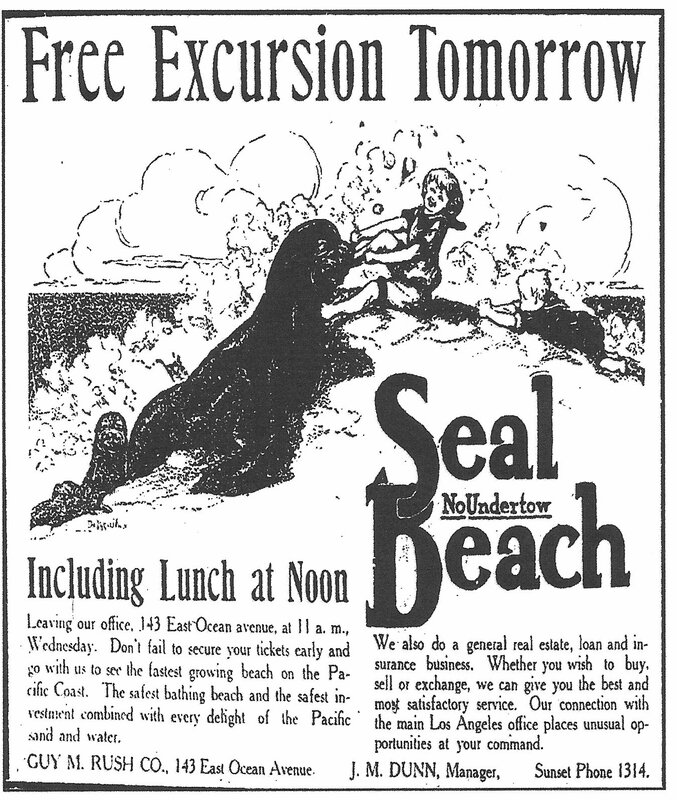 When the United States entered the war in 1917 prosperity and growth of Seal Beach came to a halt. 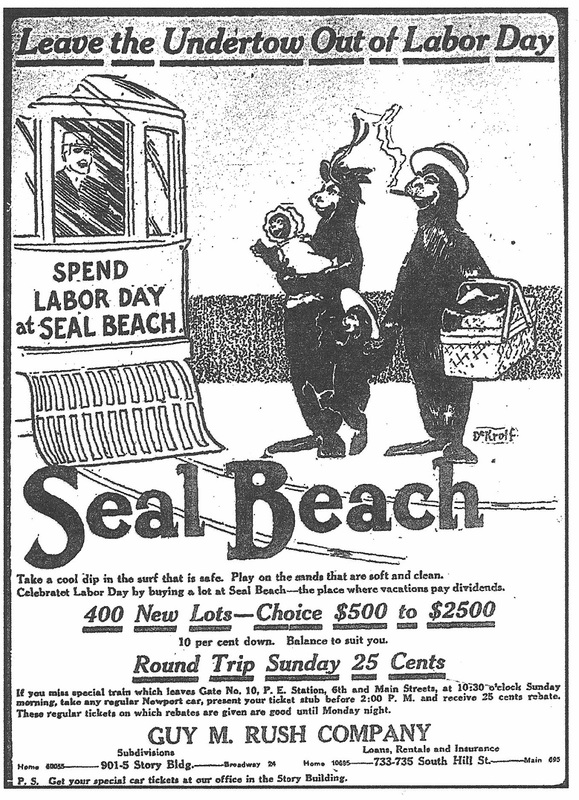 Building supplies were requisitioned for the war and attendance dropped dramatically at the Seal Beach amusement zone. Nature has done much for Seal Beach, for the western portion of the city lies on a high bluff overlooking the Pacific Ocean just like the Palisades at Santa Monica, and like the Palisades at Santa Monica it has a rich sandy loam soil which makes it especially desirable for homes of the better class, and besides, this section of the city has great natural advantages over the palisades at Santa Monica because it overlooks, in addition to the blue waters of the Pacific, the beautiful Alamitos Bay, whose waters wind in and out among the beautiful environs of Naples. The eastern part of Seal Beach slopes gently down to the waters of the ocean on the south and the delightful waters of Anaheim Bay on the east, and by many this is considered the most desirable section for investment as it is close to the bath house, dancing pavilion and main business portion of the city, and also is the part where most improvements and new buildings are going up. Great changes have taken place in this portion of the city since the Guy M. Rush Company, who are the sole agents for Seal Beach, became interested in the city. The sand dunes have been graded off and the sand used to fill in a section where it was not quite so high. Miles of graded streets have been put in, while excellent cement sidewalks and curbs are in evidence on both sides of these streets. This is also the section where most all of the improvements have been made during the past year, houses and buildings of different kinds having gone up on all sides, some of the homes being mansions equal to those found in Los Angeles and other larger and older cities. The opportunities for investment now at Seal Beach are better than ever before because it has grown by leaps and bounds during the last few months and has passed the stage where it is a question whether it is going to become a home city and resort or not. There is a magnificent large bath house and pavilion which will compare favorably with any other such structure on the Pacific coast: it contains hundreds of dressing rooms for the accommodations of bathers, and also a large plunge, which is the delight of both young and old. Another section of the gigantic building is given over for billiards and beautiful bowling alleys, which are enjoyed by the ladies as well as the men. nature. The demand for this property is bound to increase with the growth of Los Angeles and vicinity..."
Beach property was limited by nature, in Seal Beach you could purchase land for $500 ($750 if you wanted beach front), a goodly sum considering the average income in 1914 was $682 per year. Not all professions were poorly paid, a construction worker in 1914 made $1325 a year, postal workers $1150, ministers $938, electric railway employees $735. Farm laborers did not fare so well, earning only $351. In 2012 dollars that same $500 lot would equate to $11,800---still a bargain by today's standards! happened to live around the shores of Alamitos Bay up through the 1950s, the likelihood of being adopted by a sea lion or seal was good. As far back as the turn to the twentieth century, newspapers were talking about the special relationship between humans and the silky, black mammal. 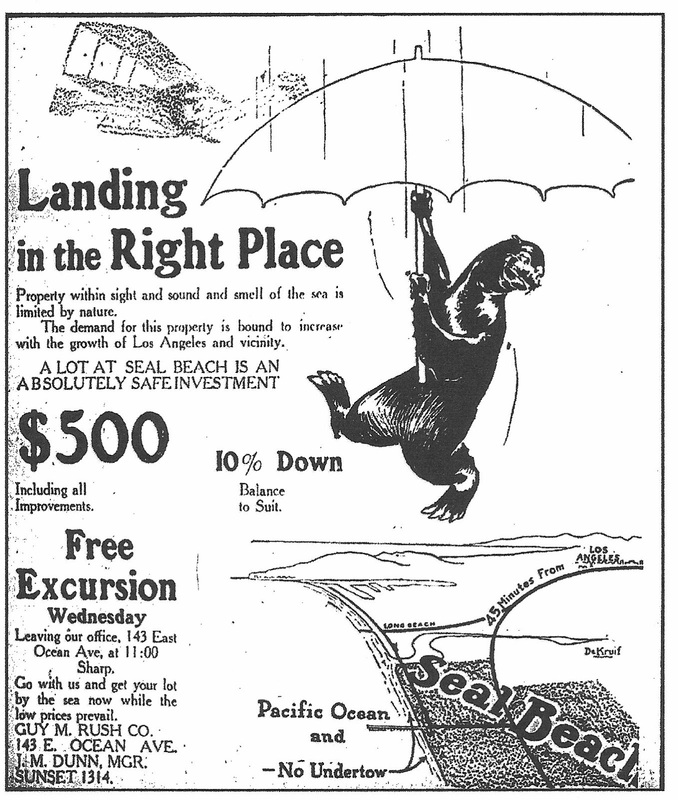 In 1906, the Daily Telegram of Long Beach, related how young Will Graves caught a baby seal in his net while fishing. After keeping it a few days, Will lost interest in the little fellow. He ended up giving it to a neighbor, who took it home to keep company with the other pets she had. The seal, "Jimmy," provided with a tub of water and plenty of fish, thrived well and grew at an amazing speed and eventually became a circus star. "Some Seal Beach bathing. Come on In! Let your youngster say it. Give him a chance to say it. Where the sand is clean, and the fun is clean and the ocean safe. 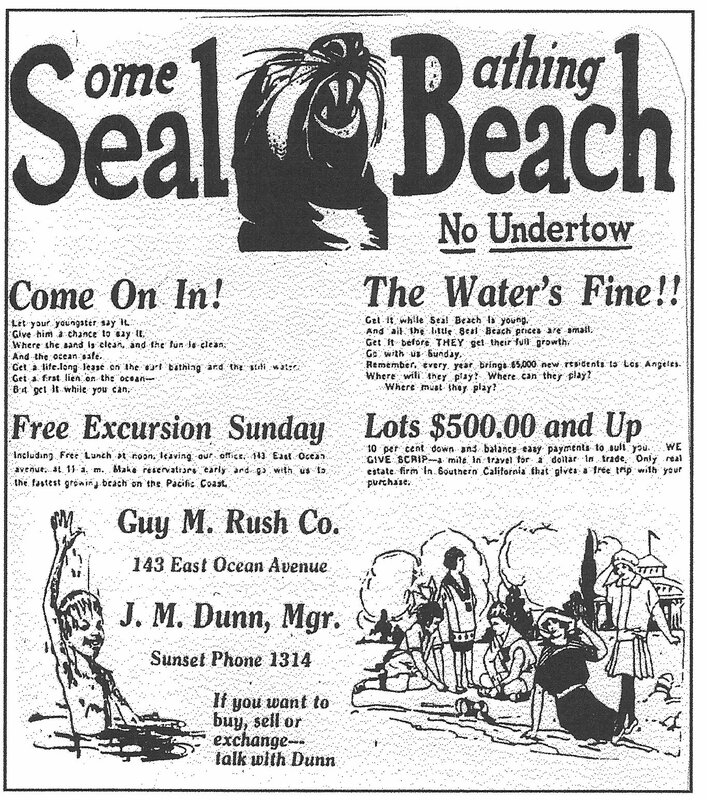 Get a life-long lease on the surf bathing and the still water..."
In August 1924, Philip A. Stanton and the Bayside Land Company vowed to set aside the sand strip where the seals liked to meet, for a permanent city park. Stanton promised the seals would be given a full-time police unit to see they were not molested. Seals weren't the only concern of Seal Beach officials. In the 1970's pet laws were revamped and an ordinance was drafted requiring leashes for cats and dogs alike. Cat owners were so incensed a compromise law was passed, this one prohibiting cats from "trespassing." However, there was no law against seals trespassing, as Mrs. Sam Ashbrook found out one evening. She reached down to pet her cat, but what she found instead was a fifty-pound seal. She was amazed, because her apartment was on the second floor an the seal had to have climbed twenty steps to get there! "Swing into line with your friends into health, into profits. 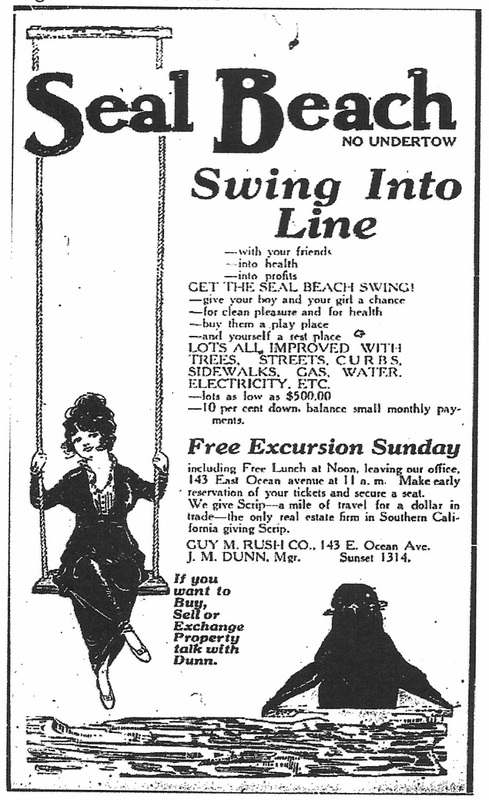 Get the Seal Beach swing! 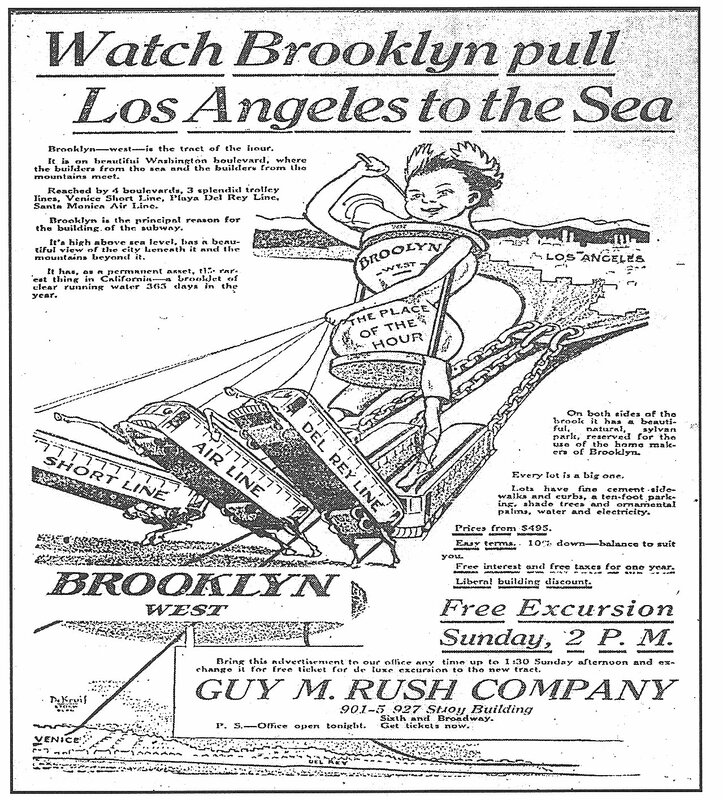 Give your boy and your girl a chance for clean pleasure and for health, buy them a play place and yourself a rest place..."
Henri DeKruif did other illustrations for the Guy M. Rush Company, which had numerous other real estate tracts throughout Southern California, such as this one advertising Brooklyn West, a real estate development on Washington Boulevard. 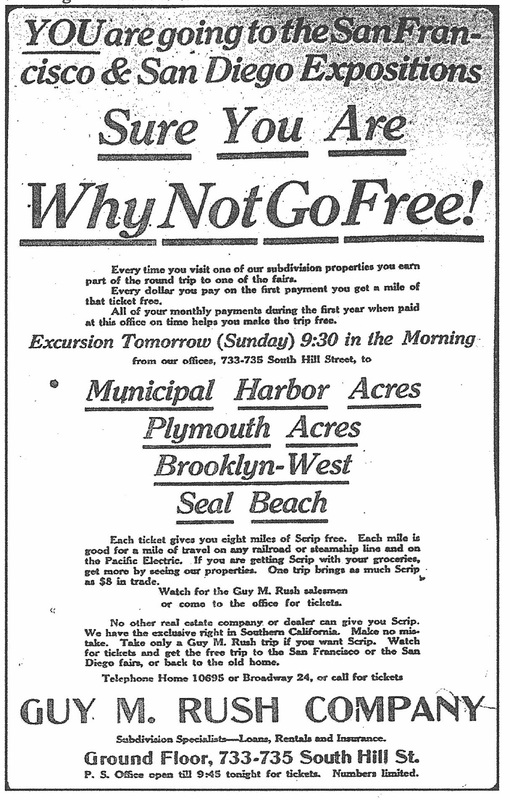 visited one of the company's subdivisions they earned free mileage (scrip) on any railroad, steamship, or Pacific Electric rail line traveling to either the San Francisco or San Diego Pan Pacific expositions, as this ad demonstrates. Every dollar paid on an actual purchases of land entitled the buyer to one free mile for every dollar paid. In addition, all monthly payments during the first year earned mileage towards a free trip. But the payment had to be on time! 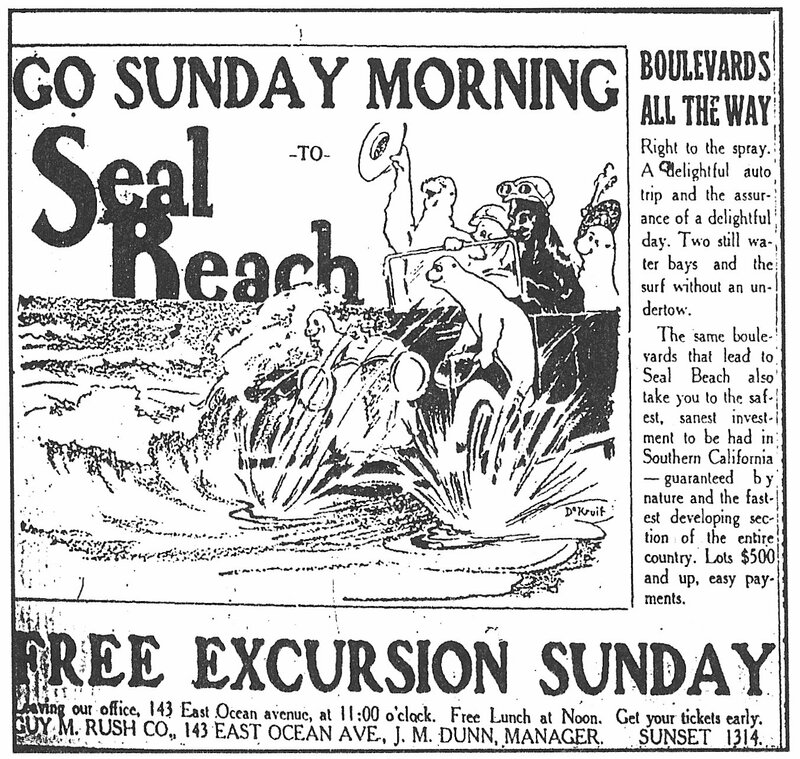 This ad on October 17, 1914, was the last to appear in local newspapers touting the virtues of Seal Beach. For fifteen months the Bayside Land Company had utilized the talents of Henry Gilbert DeKruif to sell real estate in their new development. During the fall and winter season of 1913-1914, 65,000 tourists came to California. Many remained, choosing Seal Beach as their home. 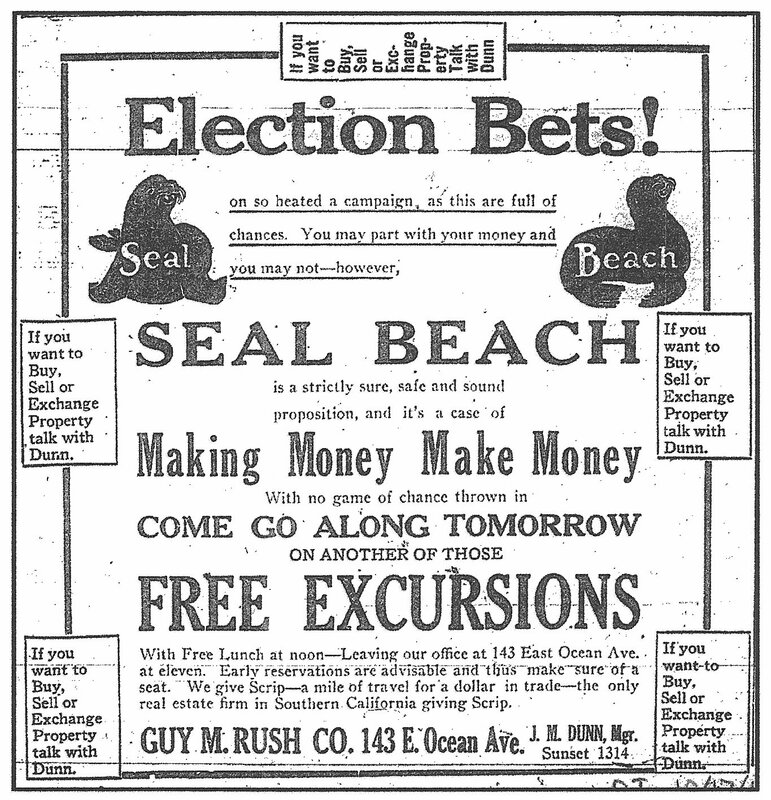 On October 19, 1915, residents of Seal Beach voted 84 to 14 to incorporate and become a real city. Miletus H. Snow, whose family owned the A.B. Snow Lumber Company, was selected to handle the finances of the new city as treasurer, the only paid position. City Clerk was A.L. Havens, a real estate promoter and secretary of the Seal Beach Chamber of Commerce. Trustees included Harry G. Magie, an employee of the Bayside Land Company; Herman J. Eichorn, a wiring inspector for the Los Angeles Gas and Electric Company; James Hamilton Blagge, a life insurance salesman and stock broker; C.A. Little, pharmacist. City founder John Ord was unanimously elected mayor by all 98 citizens casting ballots. At the November 4, 1915, meeting of the city council, Ord was presented with a gavel and block made from a Cassia tree. The tree had been planted by the judge in front of the post office, which was the first building in Seal Beach. Shortly after Judge Ord resigned as postmaster of the city, the tree died. An interesting co-incidence. The seals that gave the town its name were not forgotten either. Ordinance No. 3 adopted the seal for the city of Seal Beach. 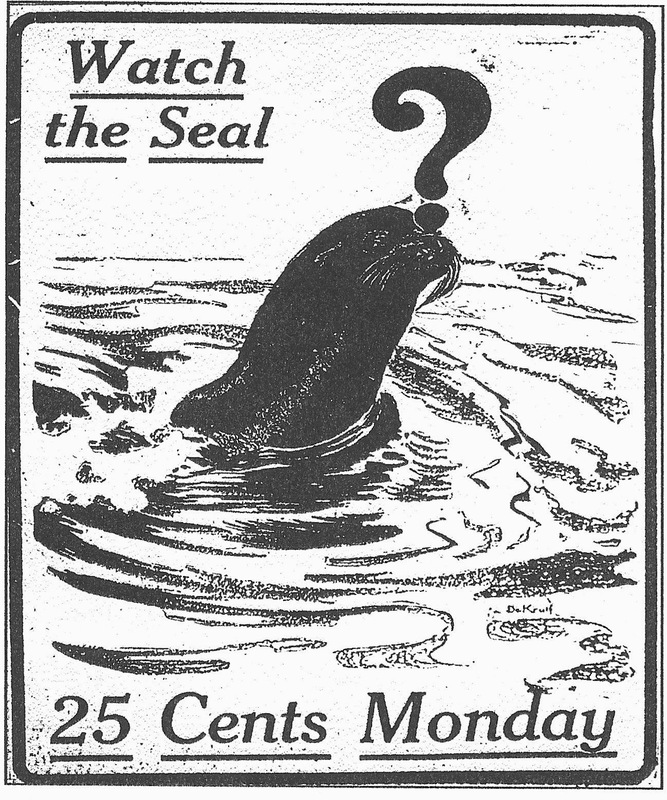 The seal for the city would be a circle with the sea mammal in the center, and the name "Seal Beach" impressed upon the seal, and the words "incorporated October 27, 1915,"(the date the State approved the election results) directly below. The Bayside Land Company was still actively involved in the city. Phil Stanton arranged to bring a number of displays from the San Franciso Panama-Pacific International exposition. Most notable was a battery of scintillators (searchlights) with colored lenses which were erected on the end of the pier lighting up the sky for a distance of fifty miles. A big fountain called the "Setting Sun" was also bought from San Francisco and placed in front of the pavilions and stocked with live seals. Many of the classic fountains, statues and ornamental light standards, which lent beauty and charm to the great courts and passages between the palaces at the exposition, were also shipped to Seal Beach. Four thousand feet of ocean frontage were set aside to handle all the attractions coming from San Francisco and the new roller coaster. 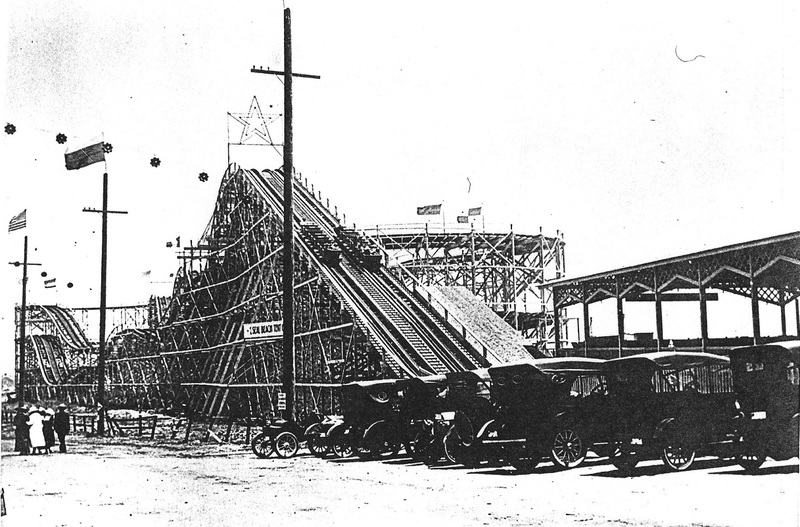 The new amusement zone, complete with the latest state-of-the-art roller coaster opened May 1, 1916, but development would soon come to a halt when, on April 2, 1917, the United States went to war with Germany. All amusement areas were declared non essential and with it attendance at Seal Beach dropped. 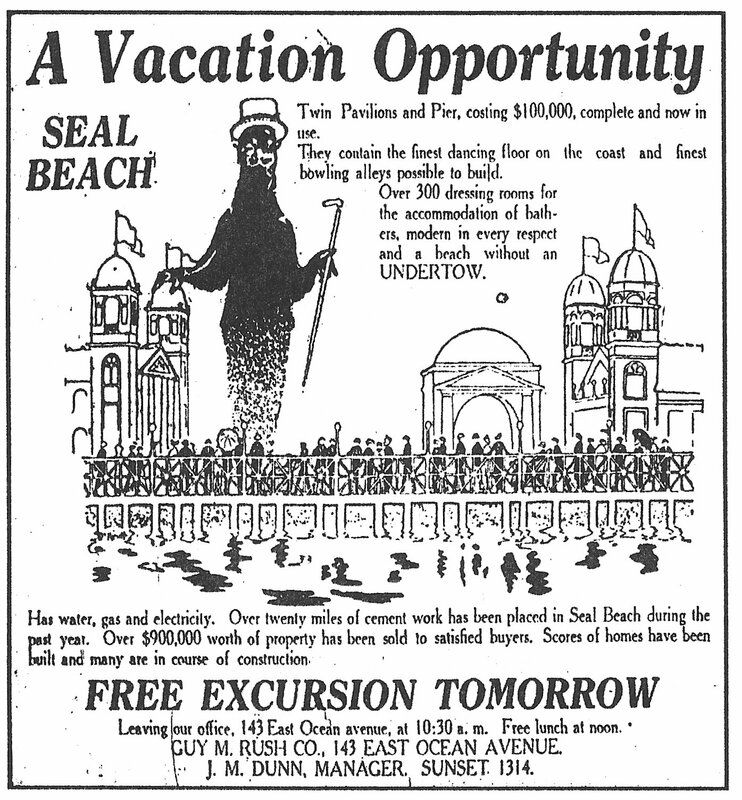 Following the war new amusement places sprung up and the attractions at Seal Beach were almost forgotten, according to the Long Beach Press (12/9/1923). To make matters worse a terrific fire in August 1923 destroyed much of what was known as "Seal Way." Seal Beach at Anaheim Landing. The other extended out from the west limit of the beach at Alamitos Bay. Wrecking "unsightly structures" along the beach front, included the removal of much of Seal Way. In July of that same year sixteen people were trapped on the Seal Beach pier when a 60-foot section of the shore end collapsed into the ocean. 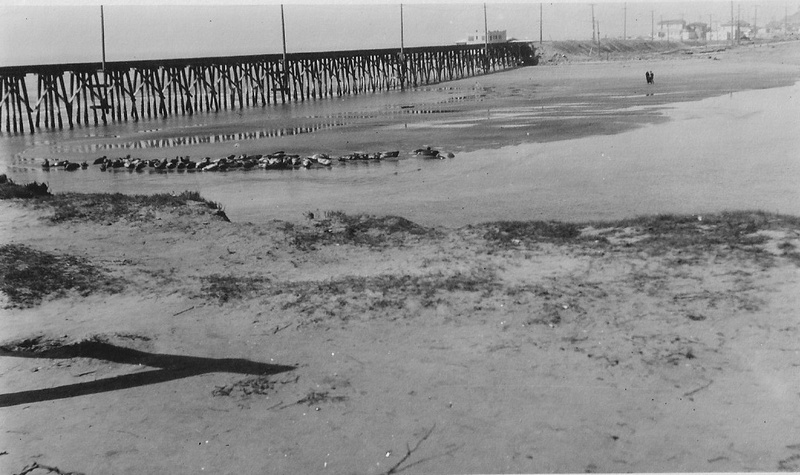 In December 1936 high winds and heavy seas washed away another 50-foot section of the pier. A new $110,000 pier, paid for with federal money, was dedicated May 20-21 1939. The 1865 foot long structure also included a restaurant and boat landing. 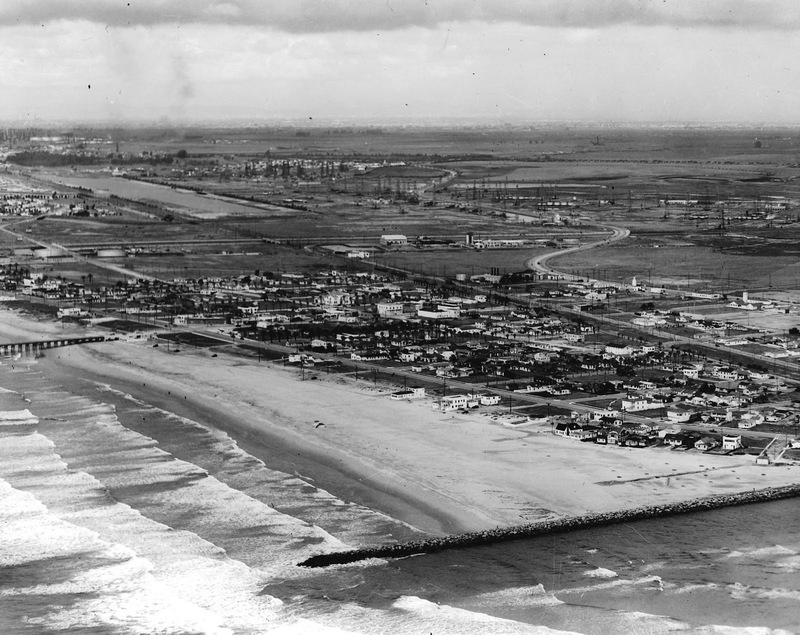 In early 1944 a mass exodus of 300 homes at Anaheim Landing began, as many were either moved or razed to make way for the $20,000,000 Navy ordnance depot. Construction on the 5000 acre depot began March 28, 1944, and operations began in late October. Also in 1944 the Marine Exploration Company began to drill for oil in the ocean off Seal Beach. With new jetties, a Navy station, oil drilling and other developments encompassing Seal Beach, the seal that gave name to the city began to seek new lodgings. However, it would not be forgotten. 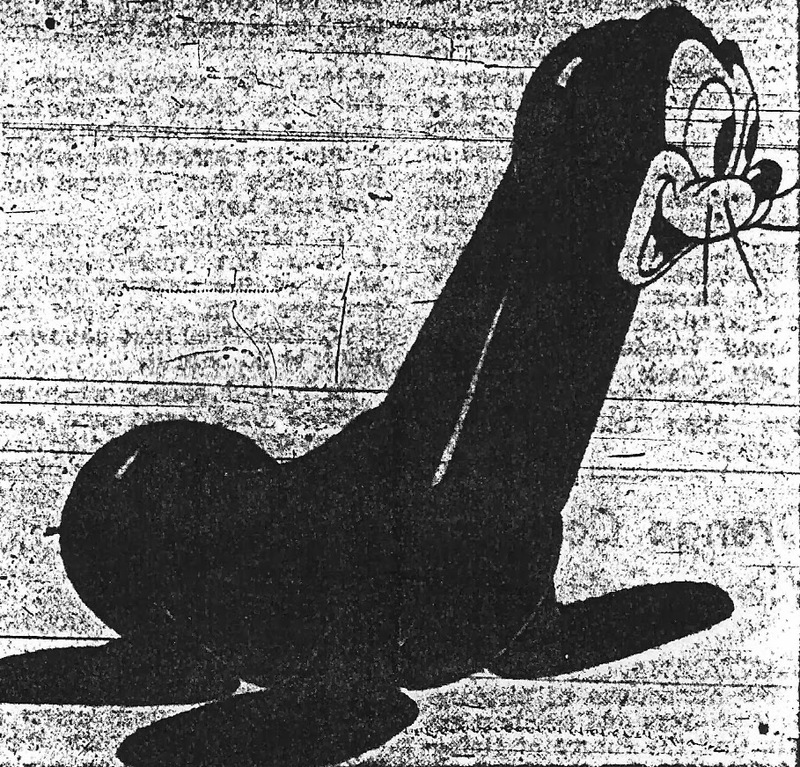 In 1941 the Walt Disney studio presented the city of Seal Beach this image. Which do you prefer? The Disney version or the DeKruif original?? This brings to an end the series of illustrations by Henri DeKruif promoting the Guy M. Rush Company's transformation of Bay City to Seal Beach. I hope you've enjoyed the ads, as well as articles.